South Korean President Moon Jae-in says North Korea must bear "heavy responsibility" for the death of a 22-year-old U.S. college student it detained for nearly a year and a half. He said in an interview on "CBS This Morning" broadcast Tuesday that while it's not known for sure what happened, there can be speculation that North Korea made "unjust and cruel treatments" to Otto Warmbier. He died Monday in Cincinnati. Moon expressed condolences to the Warmbier family and the American people. He said Warmbier's death shows "we must now have the perception that North Korea is an irrational regime," but that dialogue with the North is still needed because sanctions and pressure haven't resolved the North Korea nuclear issue. U.S. Sen. John McCain says Americans who are "stupid" enough to still want to visit North Korea should be required to sign a waiver absolving the U.S. government of any blame if they're harmed while there. The senator from Arizona says, "There should at least be a form for them to fill out that says, 'If I go to North Korea, I understand I am taking great risk, and I do not hold the American government responsible.'" He says "if people are that stupid that they still want to go to that country, then at least they assume the responsibility for their welfare." U.S. college student Otto Warmbier died Monday, days after his release from North Korea. The coroner's office in Cincinnati is investigating the death of an American college student who died less than a week after his return from North Korea, where he was detained for nearly a year and a half. A spokesman for the Hamilton County coroner says Dr. Lakshmi Sammaraco's (LAK'-schmee sam-MAHR'-rahk-oh) office has accepted the case of Otto Warmbier, who died Monday in a Cincinnati hospital. Justin Weber told The Associated Press on Tuesday morning that a press conference is expected later to provide details. 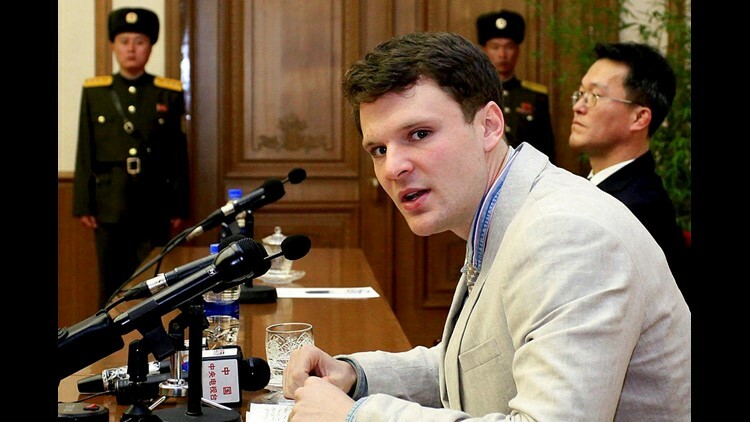 Wambier's parents did not cite a specific cause of death, but cited "awful, torturous mistreatment" by North Korea. Doctors had described Warmbier's condition as a state of "unresponsive wakefulness" and said he suffered a "severe neurological injury" of unknown cause. Doctors had described Warmbier's condition as a state of "unresponsive wakefulness" and said he suffered a "severe neurological injury" of unknown cause. He arrived in Ohio on June 13 after being held for more than 17 months.